Warmth from wind chill when wet and out of the water. A slight positive buoyancy gives confidence and reduces the chance of exhaustion while swimming. Protection from sunburn and jellyfish stings. Bright colours make your child easier to see in the water. 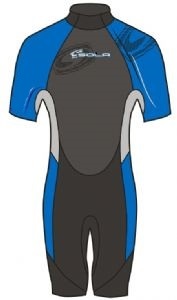 A snug fitting wetsuit keeps a thin layer of water between your skin and the suit. Your natural body heat, insulated by the material (neoprene) of the suit, warms this thin layer of water. The closer the fit of the suit to your own body shape the warmer the suit will be. A Steamer is a suit with sealed seams, usually achieved by cup or blind stitching. This stops the majority of cold water from re-entering the suit once your body has initially heated it up. 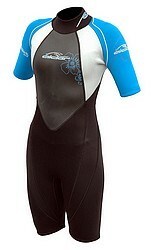 Winter wetsuits are steamers with a 5mm body and legs for warmth and 3mm arms for manoeuvrability. These are usually described as 5mm or 5/3mm or 5/4/3mm. Winter suits should really be described as Three or Four Season Suits, as they are essential in the UK and northern Europe from September to May. Titanium is a metal similar to Aluminium and Magnesium. It works by reflecting body heat in the same way as tin foil and survival blankets. A nice fitting, well made suit is more important than having it made out of titanium. Most of the major manufacturers including Alder are stopping the use of Titanium. or hair conditioner to remove excessive smells. But only occasionally. Super stretch suits are best kept flat and folded behind the knees and then in half. Only use a hanger for short periods of time and use as wide a hanger as possible. Mesh is the term for neoprene without the usual external nylon coating. It is very flexible and thus more comfortable than double lined neoprene and also warmer in strong winds. Mesh should only be used in carefully chosen areas of the suit as it is more prone to damage from sharp objects. Also known as "X" Stretch Neoprene. Developed for excellent stretch and memory. Hard wearing stretch nylon on the outside with softer super stretch nylon on the inside provides excellent comfort and fit. A double lined suit is quite simply a suit that has a lining on the inside and a similar covering on the outside of the suit. Flatlock stitching is a strongly stitched seam that leaves a flat seam on the inside of the suit as well as the outside. 5mm torso. Twin needle blind stitched. 3mm body Super stretch sleeve and shoulder. Heat taped on stress points. Tough knee pads. Key holder. Metal YKK zip . 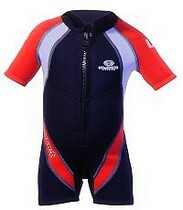 All the Kid's Suits come with a 12 month warranty against the seams splitting and the zips breaking. This double lined suit, excellent value with many features such as fully adjustable Velcro neck closure to eliminate cold water.